My heart has been with Cary Home since I was first introduced to it several years ago at an AWBO meeting. 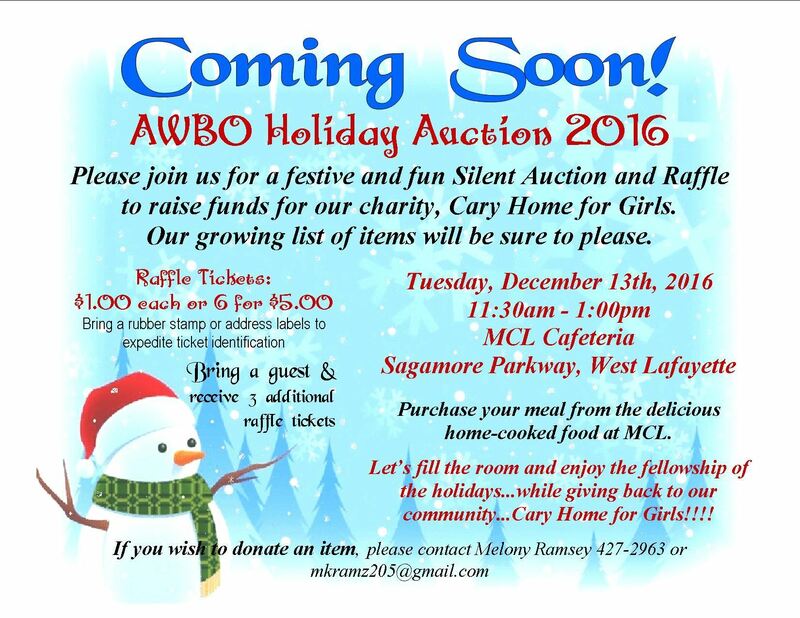 Every year AWBO has had a fundraiser, we have chosen Cary Home to give back to the community. Before new state regulations were recently put into place, I would go and make crafts with the girls who were in the house at the time. It was really a blessing to have some fun with them making Christmas decorations to decorate their Cary home with or give to a special family member. Other AWBO members also went to share their talents or professional skills with the girls. These were girls who were abruptly uprooted from their homes, sometimes through no fault of their own. They would find themselves away from family and those they love at very difficult times, like holidays, birthdays, a family member who is seriously ill, etc. They could be in need of everything that we have access to in life, like clothing, pajamas, toothbrush and paste, shampoo, comb and brush. You name it, they were often without it. But today I would like to share with you some history that I learned about Cary Home. “Jessie's Kids is named for Jessie Levering Cary, a Tippecanoe County native who was dedicated to the welfare of children. On December 11, 1929, Franklin Cary donated funds for the Jessie Levering Cary Home for Children, named in memory of his wife. The home was dedicated on November 30, 1930. Until 1972, Cary Home operated as an orphanage, housing boys and girls with bad home lives. Cary Home later became a residential treatment center for adolescent boys and girls. Today Cary Home for Children strives to prepare adolescents for successful re-entry to the community through case management and treatment, educational support, family services, and behavior modification." “Jessie’s Kids Foundation, Inc., formerly The Friends of Cary Home for Children, was expanded in order to better serve at-risk youth all over Tippecanoe” and not just at Cary Home. I previously mentioned the state changes and not being able to go and do crafting any more. I discovered another way that we can help besides having our fundraiser. There is a desperate need for Big Sisters, and of course a greater need for Big Brothers, to help those who go through the home. Some may be there for a few weeks while others, a few months, but EACH ONE needs that big sister or brother to mentor them and just be a friend, listening ear, a shoulder to cry on. It’s time for ACTION at the AUCTION and raffle tomorrow, Tuesday, Dec.13. AWBO’s fundraiser for Cary Home for girls is from 11:30am-1:00pm at MCL Restaurant & Bakery in West Lafayette! You won’t want to miss it. Bring a gift for the girls (wish list is on Jessie’s Kids website and Amazon or posted on AWBO’s Facebook), a donation, a friend, your billfold to buy. Everyone’s invited to join in the fun while giving back! See you there! Thank you to Linda Berryman for stepping up and providing the speaker gift in November! AWBO Members are always welcome to post news about their business' special events, workshops, Open Houses, new certifications, or achievements in this newsletter. Submissions are due in finished form (a/k/a written concisely) to kimberlyringler@gmail.com by the 20th of every month. You must include the words "AWBO" in the subject line. Want to advertise a general product special or news item of your choice? AWBO members are welcome to distribute tabletop fliers at our monthly meetings and/or register for an upcoming 3-minute spotlight. Hope to see you at the next meeting. Put it on your calendar today...and invite a deserving friend to join you. Visitors are always welcome. No registration is necessary and visitors may attend twice at no charge before becoming a member. Arrive at 11:30 to enjoy lunch and networking time. Membership renewals for the 2016-2017 season are due October 1st. You can renew online at www.AWBO.org or contact Linda Berryman or Isabel Hogue. You must include "AWBO" in the subject line. Holiday Auction 2016 Is Here! December is a very special month for many reasons. There’s time with families, gift giving, singing, school programs, parades and many other things. However, for the Association of Women Business Owners, we take time out of our very busy schedules as business women, mothers, and grandmothers to give back to the community through a fundraiser for Cary Home and the young ladies who come and go throughout the year. Here is a letter from Karah Rawlings, Program Coordinator for Tippecanoe County Youth Services and girls presently residing there. “The girls who live at Cary Home come from diverse and varied backgrounds. We never know what to expect when a girls arrives, so we have to be prepared for many contingencies. Some arrive with nothing but the clothes they are wearing, in need of all basic items including pajamas. Some arrive without clothes that are weather appropriate or that meet their school’s dress code, so we have to supplement their wardrobes. Others have basic needs met, but need items to help them boost their self-esteem or dress up for court or job interviews. The donations we receive allow us to meet all of these needs and empower the girls to choose from new items that they can then call their own. We wanted to say thank you for the new dryer. It has helped out tremendously, we don’t have to take laundry back and forth from building to building. Our laundry gets done faster as well. All we wanted to say is thank you! PLEASE set aside Tuesday, December 13, from 11:30 to 1:00, to enjoy the silent auction and raffle Fundraiser at MCL Restaurant and Bakery in West Lafayette. While you’re there, you might want to treat yourself to MCL’s delicious food, made fresh daily. Consider donating an item for the auction and invite others to donate. Give items for the raffle and buy tickets to put in the bag for a raffle item of your choice. Bring a guest and receive 3 free raffle tickets. Tickets are $1.00 each or 6 for $5.00. Come and enjoy bidding on silent auction items. Bring an item from theCary Home Christmas wish list, found on AWBO Facebook and Cary Home orJessie’s Kids websites. Plan ahead and start saving money! It’s almost time to do your Christmas Shopping at the Fundraiser for Cary Home for Girls. (Tuesday, December the 13th , from 11:30-1:00 at MCL, West Lafayette). What fun it is, every year, to see the donations from AWBO members and the community as we pull together to give back! I can’t tell you how excited and thankful Cary Home was to receive the big check of $5000.00 last year that we presented them at our meeting in February, this year! Speaking of being thankful, November is the month where we are reminded to think about- and be thankful for-all that is around us: our loved ones, our companies and customers, and hopefully the “little things” we take for granted. Those little things, such as grabbing a drink of clean water or snack from the fridge because we’re hungry! It struck me: many people don’t have these “luxuries”. I do these things on a whim without thinking twice. But I should! This morning I had the indulgence of a nice, warm shower (including soap and shampoo) in my nice warm house. I ate a good breakfast and plan on having a good dinner tonight. Something else I often take for granted: how fortunate we are to live in the United Stated of America. Unlike many women worldwide, we have the freedom to start our businesses, run them as we see fit, and participate in our little part of the “American Dream”. And it’s all because some very brave people, hundreds of years ago, decided to strike out for freedom in tiny ships! I look forward to seeing you at the December Fundraiser/auction, where we can give to young women to help meet their needs and show them that someone DOES care about them and what they are going through. I am very thankful for each of you and look forward to our monthly meetings where we encourage one another. We thank Nadine Morgan, Purdue Women's Basketball. Guess what she donated? Basketball tickets for our November speaker, Stuart Boehning, Attorney. Thank you for attending and hope to see you soon! 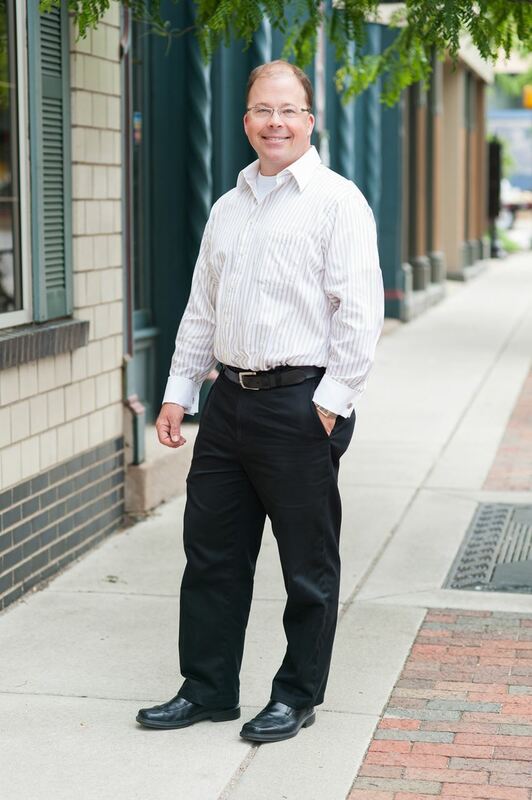 Stuart attended the Kelley School of Business at Indiana University and has been practicing law for over 20 years. At BB&C, he focuses on estate planning, transactional and corporate law. He assists clients in creating LLCs, buying or selling businesses, and setting up living trusts. Because he owns several companies himself, Stuart understands how to incorporate children into business and estate plans and provide a secure future. One of Stuart’s most memorable cases at BB&C included a nine-year, twice-appealed case that eventually received the largest verdict in the firm’s history. “Helping my clients establish business succession plans and family needs in a way that will advance them through the next generation is what’s most rewarding,” he says. Outside of work, Stuart enjoys spending time with his family. He also enjoys fishing and working on his family’s horse farm with his wife, Ann, and their four children. Farmers Insurance, nationwide, is collecting Suits for Soldiers and my office is participating. More than 1 million military personnel will be making the transition to the civilian workforce in the next couple of years. So to make their transition easier, we’re collecting gently worn, dry cleaned business suits for both men and women. Suits for Soldiers can be dropped off at my office at 11 N 3rd St in Downtown Lafayette now through November 30th. Submissions are due in finished form (a/k/a written concisely) tokimberlyringler@gmail.com by the 20th of every month. You must include the words "AWBO" in the subject line. As your new president, I tell this story to challenge each of us to stay active in our organization, get to know other members and look for ways to grow AWBO and each other. We are unlike any other group in this area! Women’s Resource Committee of Lafayette Young Women began its journey in November, 1981 with the first meeting in May, 1982. As we start our new year, I look back to 2009, when I joined the organization which was soon renamed, Association of Women Business Owners. In 2010, I was invited to join the Hospitality Committee, where I continued to serve until 2015. I loved working on the Hospitality committee but when Susan Benedict became president in 2015, she asked me to move to Programs. I accepted but kept asking her if she needed me somewhere else. No, she assured me, I was where she needed me. I wasn’t at all sure I could handle the job until she paired me with Deb Plue. We each had our own skills and strengths so we complimented each other and have been a great team. But little did I know that Susan put me on Programs so she could stretch me…..let me experience new challenges. Then it happened! In March, Susan asked me to be President-Elect as well as finish my year on Programs. It has been a real challenge, but also an amazing year of growth. I have broadened my knowledge of AWBO and had a chance to see how the well-oiled machine works. Where will AWBO take you? Is there a committee experience in your future? Perhaps a Board position? Maybe working with a new member to help her grow her business! One thing I have learned in these past 7 years: the Association Of Women Business Owners is a great place to learn, spread our wings and grow. Join me in the adventure! A thank you goes to Linda Uerkwitz of Industrial Plating, Inc for providing a gift for October's speaker, Shelly Bays. Rhonda Feuer, Independent Advanced Director for Pampered Chef, is excited to announce that October is Help Whip Cancer month. The popular Infusion Water Bottle will have the Help Whip Cancer logo in pink on it and a $1 for each one purchased will go to the America Cancer Society. We can have a fundraiser party and or offer exclusive products via cooking/catalog shows. We can party for a cause, pick up quick meal ideas that get you in and out of the kitchen in no time. Let's make mealtime fun and easy!! Or you may need help with kids in the kitchen or entertaining ideas. We will also have some new enteratinng products that start in October including an awesome "electric" wine opener. Please visit www.pamperedchef.biz/rhondafeuer to see the products, pick up a new recipe or place an order. Call Rhonda at 765-426-6061 for a catalog, host show or with referrals for show/fundraiser/consultant. Shelly Bays is an entrepreneur and advocate for living a life of significance. She is an internationally certified Speaker, Trainer and Coach with the John Maxwell Team and 14 year veteran with the Aflac insurance company. Shelly brings the leadership principles of the worlds leading expert on leadership development, John C. Maxwell, to life through her work with entrepreneurs, teams, and individuals. 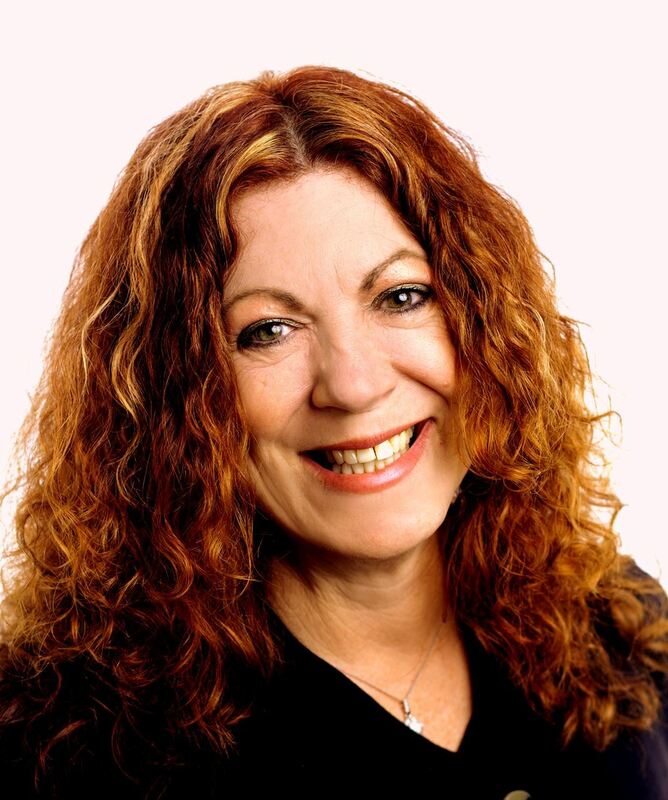 With over 30 years experience as an entrepreneur building successful businesses and teams in multiple industries; having been the leader of multiple volunteer organizations, and having served two terms as a school board member and Board President in Lansing, Kansas, she brings personal experience and lessons learned to her clients in a way that helps them engage, discover, grow and empower themselves and others. With a passion for empowering women, Shelly’s philosophy is to help build others up so that they can live the life that they desire. By becoming intentional about personal growth, and developing leadership and empowerment skills, she believes in the “power of multiplication” and that by helping others to reach their maximum potential, we can change the world. As a wife, Mom of 7, Grandmother of 5 ½, Fur Mom to 1 rescue dog, and entrepreneur, she enjoys spending her “spare” time attending her children’s sporting and school events, riding “Lola” (Harley Davidson motorcycle) with her husband Alan, traveling, camping, any kind of new adventure, enjoys a glass of wine on occasion and writing. Ghastly. Ghoulish. Ghostly. Giving? Redefine Halloween by donating blood at The Russell Company blood drive scheduled for Halloween morning. During October, thoughts drift to candy, costumes and carving pumpkins. But for many patients at area hospitals, the only treat that’s sure to please is a blood donation. Forget the trick and give a treat by donating at The Russell Company Blood Drive, Monday, Oct. 31 from 9:00 a.m. to 12:00 p.m. at 2506 Covington St., West Lafayette, IN. Your donation could help save the life of a ghost or goblin close to you. The staff will also be hosting a chili cook-off from 11am-12pmin their office. Try samples from a variety of chili’s and vote for your favorite! Ram-Z Exchange opened in 1988 on Elmwood Avenue. By 2007, they had outgrown that location, so everything was moved to 205 Farabee Drive North. In 2009, the name was changed to RamZs Emporium- “a store with a huge variety of merchandise under one roof”. It became a place “Where you’ll find things you didn’t know you needed, but now you desperately want”. While many new things arrive daily, some are so unusual that you would never expect to see them in Lafayette. In 9,000 sq. ft. of space, there are over 130 displays of fine jewelry, coins for collectors and investors, antiques and collectibles, guitars and some electronics as well as firearms for hunting or protection. They repair treasured jewelry and miscellaneous items at their store daily (it isn’t sent out). RamZs can also custom design a new jewelry piece to meet your satisfaction. People also come to them in need of some cash so they became the oldest licensed pawnbroker in 1990, giving loans to those in need during crisis times. Notary service is also available. December of 2007, they won the Small Business of the Month award. Melony later served on the committee and became co-chairman. Currently serving on the Greater Lafayette Commerce Education Committee, she really enjoys helping with Golden Apple Award selections. 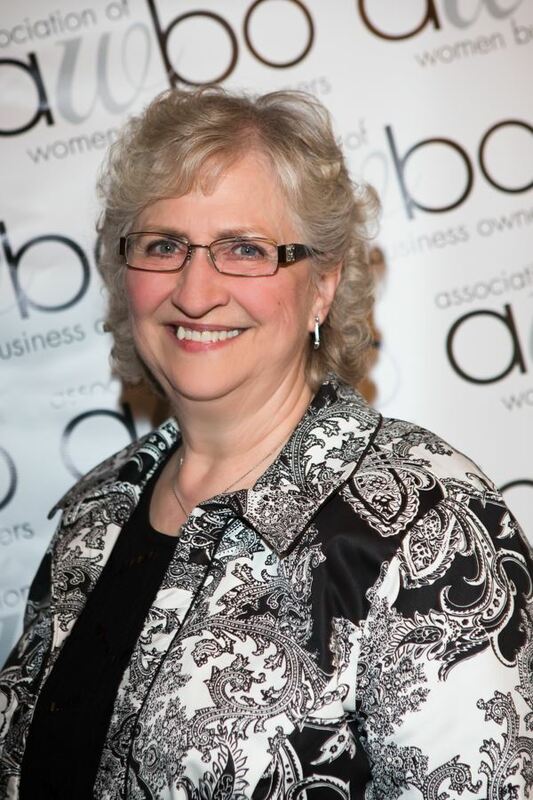 Being in AWBO for several years and on the board has been a favorite thing because she’s learned so much, developed many friendships and found several members who have given her help in many ways. Stop and see RamZs Emporium. With 17 staff members, RamZs is still family owned and operated. "AWBO is a great place to learn from speakers and fellow business owners while enjoying lunch. A business can always be improved and this is a fun way of learning how to do it." Membership renewals for the 2015-2016 season are due October 1st. You can renew online at www.AWBO.org or contact Linda Berryman or Amanda Snider. I’m talking about “Burn-out”. This is a topic you may have never dealt with. But if you have been in business for several years I’m guessing you have had to address it. What can you do? How do you snap out of it? What if….. You still LOVE your job/career? You even have a viable business. What can you do when you start to get that sick feeling in the pit of your stomach every time a normal task needs addressed? You could schedule into your calendar a longer than one week’s vacation. Studies have shown that employees who take five weeks of vacation a year, are more rested and effective at their jobs. In fact Henry Ford was probably the first in the mid-1920s to identify this phenomenon. He reduced the workweek from six days a week to five and from 48 hours to 40 after his company discovered diminished productivity returns. So whether you are dealing with burn-out or just looking for more ways to be effective at work-let’s get that calendar out. It’s time to go against the grain and schedule in time for your next vacation yet this year! One of our members recently took the residents on a shopping trip to Macy’s. Each girl had a chance to be personally fitted for and received 2 new bras. Always in need of bras including sports bras, Hair Brushes, Good Quality disposable razors and shaving cream, Shampoo/Conditioner, body washes, Cardigan or white sweaters, Larger size pants and shirts sizes X-Large- 2X, winter coats, pull-on boots, swim suits nail polish, make-up, mascara, lip-gloss, and craft supplies. Bring donations to a membership meeting and we will see that they get to Cary Home. Membership renewals for the 2016-2017 season are due October 1st. You can renew online at www.AWBO.org or contact Linda Berryman or Amanda Snider. Coming to AWBO for a second time is Debbie Elsner, a native of Albany, New York and graduate of Maria College. She and her husband moved to Lafayette in 1976 so he could finish his education. The move that was initially intended to be temporary, has already lasted 40 years, giving them a chance to raise their son and now enjoy grandchildren. Debbie's work experience has been in Human Resources and the Non Profit sector starting in 1980. Many years of paid and volunteer work with the American Red Cross brought her to the role of Executive Director. Upon retiring, she formed her own organization in 2009, Personnel Matters, LLC. She works regularly with small businesses, non profits and organizations not large enough to have someone trained in Human Resources. Helping others and teaching them the things they need to know to successfully manage their staff brings a smile to her face. And as if one business isn't enough to occupy her time, she has TWO! Dabbling in making lovely Swarovski crystal jewelry became a business and it has gained her enough attention in other states that she makes beautiful pieces for them to sell in their stores. Brides seek out Debbie's wedding planning skills and her Beaditude Jewelry to adorn their bridal parties. Membership renewals for the 2016-2017 season are due October 1st. You can renew online at www.AWBO.org or contact Linda Berryman orAmanda Snider. Hear from current members and some outsourced Social Media users about how they use this tool to promote their business. *How and Why Social Media took over market share from traditional forms of advertising. *Which Social Media works best for different types of businesses/age demographics? *When is the right time to engage? *What do I need to know about using various platforms? *How can I test and measure? * When is it best for busy women to outsource this area-What can I expect? * Are my goals actually achievable on Social Media? Have a specific question you would like answered? Please email questions to Melony Ramsey at mkram205@gmail.com by Thursday, Aug. 4th. Membership renewals for the 2015-2016 season are due October 1st. You can renew online at www.AWBO.org or contact Linda Berryman orAmanda Snider.